Tree and shrub leaves are divided into two main categories: simple and compound. Simple leaves have only one leaflet on each stem, while compound leaves have many leaflets attached to one long stem. Compound leaves may be serrated or have rough edges, but only simple leaves have deep clefts. Cleft leaves have deep notches that extend almost all the way to the leaf's midrib. Leaves can have a single cleft, which gives the leaf two lobes, or as many as eight lobes with seven clefts in between the nodes. A single leaf extends from the leaf petiole, where the stem meets the tree branch, out along the stem midrib, which runs down the middle of the leaf blade. The leaf edge, or margin, may be entire or serrated. An entire leaf margin is completely smooth with no small teeth, while a serrated margin has teeth all along the edge. Leaves with entire margins may still be cleft, with deep notches almost to the leaf's midrib. Sweet gum tree leaves are star-shaped, with palmately-lobed simple leaves that have five even lobes pointed on the ends and spread out like an open hand. The clefts between the lobes are deep, reaching almost all the way to the leaf margin. The sweet gum tree is a large, shade-tolerant tree with leathery green leaves in the spring and summer that turn orange-red in the fall. Sassafras and mulberry leaves are mitten-shaped or ghost-shaped. The leaves on these trees are not uniform, so some leaves may not have any clefts while others have a single cleft or multiple clefts. Sassafras trees have entire margins, with no more than two clefts. Red mulberry leaves have serrate margins with as many as four clefts. Tulip poplar trees have leaves that are cleft on each side with a shallow notch at the leaf tip, resulting in a tulip-shape. The leaves have an entire margin, though some of the lobes may have shallow irregular notches on them. Maple trees, and the related sycamore trees, have three to five lobes on each leaf. These lobes often extend out palmately from the leaf petiole with a distinct vein in each lobe. The margins of the lobes are incised, with several irregular notches on each lobe. Maple and sycamore leaves are often approximately the same width as their length. 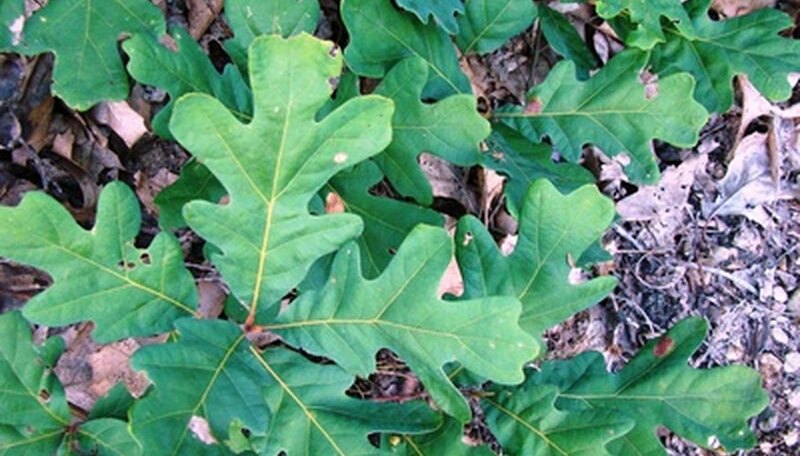 Oak trees have three or more lobes on each leaf. The lobes may be either rounded or pointed on their ends, with smooth entire margins or incised notched margins. Oak leaves are almost always longer than they are wide, often with wide clefts between the lobes. Other common trees with cleft leaves include the ginkgo biloba tree and papaya tree. Within each of the larger tree families mentioned in this article, there are many subspecies of trees that vary slightly on the descriptions of the leaf types listed. Local field guides to your region can give you an exact tree species for the leaf you are identifying.